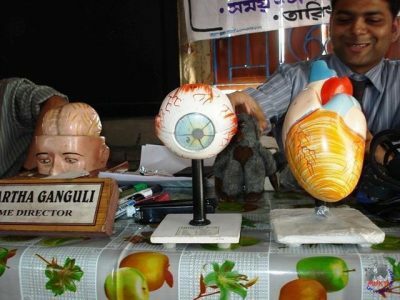 Mukti has dedicated itself to a health awareness program as a means of preventative health care. A goal of this program is to make the village sanitation be 100% compliant with modern day practices. 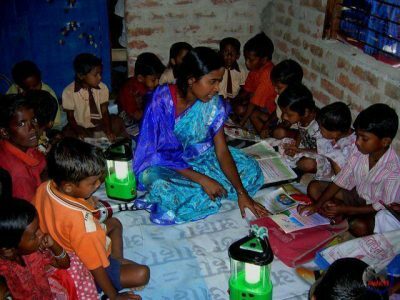 Educating the villagers and improving their sanitation habits will reduce pollution and subsequently the spread of many diseases. The main purpose of this project is to educating the villagers and improving their sanitation habits will reduce pollution and subsequently the spread of many diseases. 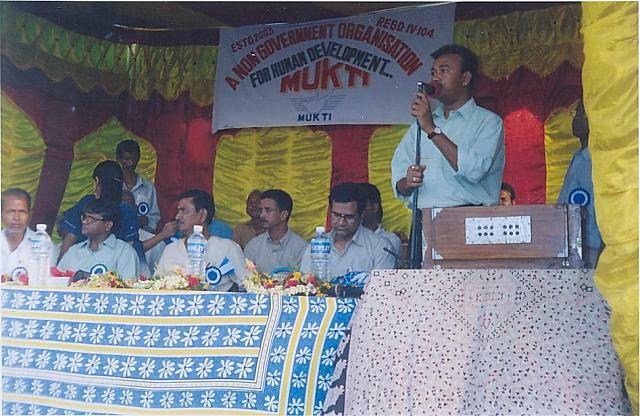 Mukti has taken up the challenge of providing low cost latrines for the needy. Studies have shown that only 5-10% of the entire Sunderban population have their own sanitation arrangement. Mukti has taken up the challenge of providing low cost latrines for the needy. 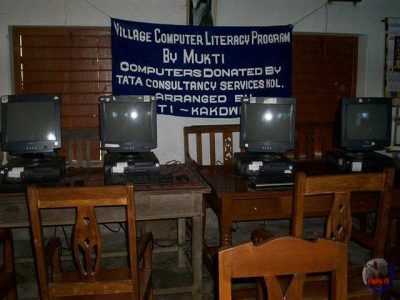 The initiative has started in the village of Purbasridharpur, where 3,000 families have been targeted as beneficiaries. The Central Government started a venture of providing low cost latrines, consisting of a base sanitation plate. The government commitment was Rupees (INR) 200 ($5) per latrine, with the recipients liable for an additional INR 250 ($6). This project was not well received by the villagers for the high cost on their part for what would have been a low quality product. Mukti suggested some improvements for the latrine (including metal corrugated sheets for a roof and door) to make it more usable. An assessment shows the cost per latrine is INR 650 ($16). 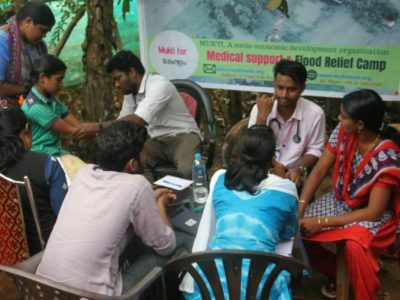 Mukti is aiming to fund the balance of the costs (INR 450, $10) with an aim to increasing health care awareness in the region. The latrines are intended for use up to two years, after which the sanitation plate and structure will be relocated. The aim is to utilize the used septic tank contents as manure. Mukti is currently researching options that will enhance the usability of the latrines from a structural angle. It is intended that the recipients will be stakeholders in any new innovations. The initial construction has been divided into three phases based on the availability of funds for the program. Phase 1 was completed in April of 2005 and Phase 2 (in progress) will be completed by March 2006. It is estimated that the project will be completed by September 2006. The construction is being performed by local Mukti volunteers, in conjunction with skilled labor provided by the local Panchayat. Currently, 350 households are recipients of these low cost latrines. Mukti representatives have also been training the households in usage and maintenance of the latrines and increasing the health awareness of the people with respect to the outcomes of improved sanitation practices. A mass assembly was held at Purbasridharpur on May 03, 2005, which was attended by the BDO and the Pradhan (head) of the local Panchayat. Mukti representatives explained the advantages of the latrines in great detail and affirmed their commitment to stay involved with the problems of the local population. 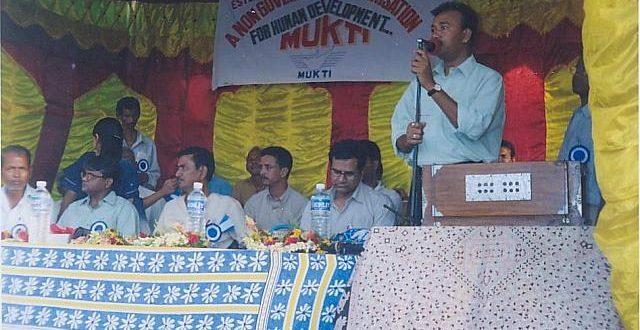 The BDO and the Panchayat Pradhan praised Mukti for their commitment; they also added that since it was not possible for the government to provide infra-structure services in these areas in an efficient or expedited fashion, they assured Mukti of their support to ensure success of this endeavor. The successful implementation of the project and the resulting benefit of sanitation and health care awareness will manifest itself in a cleaner environment and better standards of health of the local population. The project will serve as a model for other areas of the Sunderbans which can be recipients in the future for similar systems.